Buttermilk pie first popped up on my radar a little over a year ago. I read about it on a few different websites and, honestly, was a little perplexed by it. I wondered if a pie that was flavored primarily by buttermilk could be all that great to eat. Sure, I love to bake with buttermilk; I love the moist, subtle tang it gives to baked goods. However, a pie wholly flavored (well, mostly flavored) by buttermilk? That was a different beast altogether. I wasn’t sure how I would feel about it until I saw that the top of the custard pie is sprinkled with sugar so that it develops a burnt, crackly crust like creme brûlée. I can’t ever say no to creme brûlée, so I determined that it was essential for me to try buttermilk pie. 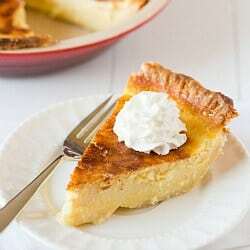 From what I’ve read, buttermilk pie is a Southern food tradition in the U.S., but it originated in the United Kingdom. 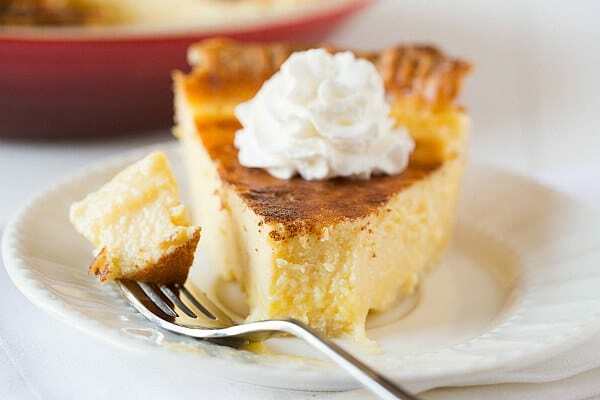 It’s similar to chess pie, but does not include cornmeal, which is an essential component to chess pie. 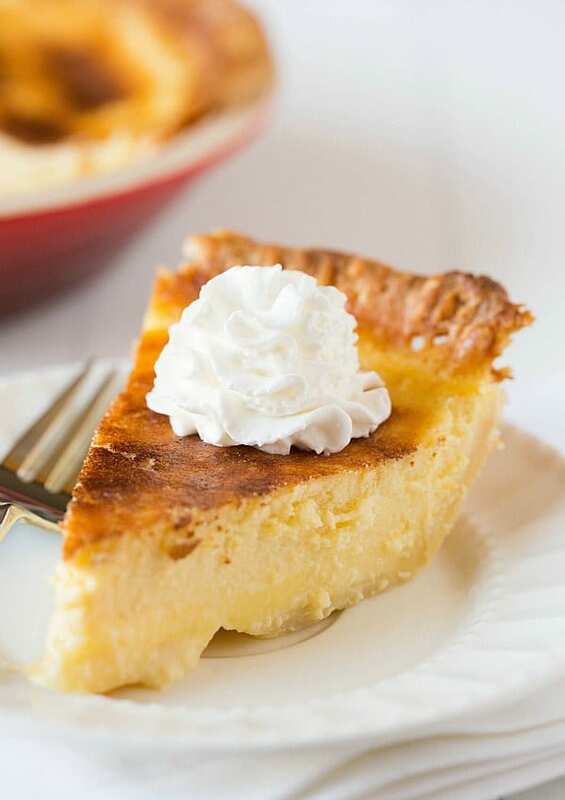 Buttermilk pie is made by simply whisking together a custard filling of sugar, cornstarch, eggs, buttermilk, cream, melted butter and some vanilla for flavor. It’s poured into a pie crust and baked, with a higher temperature at the end to caramelize the sugar topping. The resulting pie, after cooling and left to chill in the refrigerator, has a firm, custard-like consistency with a smooth, tangy flavor. Suffice it to say, if you love including buttermilk in your baked goods, you’ll absolutely love this pie! That caramelized topping will certainly garner bonus points if you’re a creme brûlée fan as well. I really enjoy discovering new-to-me regional recipes and making them come to life in my own kitchen. Do you have any favorite recipes from your corner of the world? 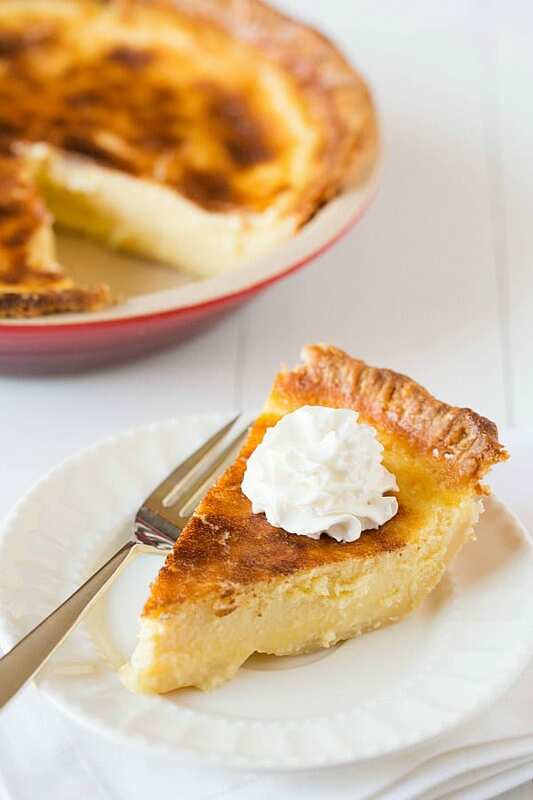 Buttermilk Pie boasts a creamy, custard-like filling with a slight tang from buttermilk and a crackly sugar crust. Make the Pie Crust: Place the flour, sugar, and salt in a food processor and pulse a few times to combine. Add the chilled shortening and pulse until coarsely ground (about 5 to 6 pulses). Add the chilled butter and pulse until mixture resembles coarse crumbs (about 10 pulses). Transfer the mixture to a large bowl. Sprinkle 3 tablespoons ice water over the flour mixture. Using rubber spatula, stir the mixture until dough forms. If dough remains crumbly, add remaining 1 tablespoon water. Form the dough into a 4-inch disk, wrap tightly in plastic wrap, and refrigerate for at least 1 hour or up to 2 days. Let the chilled dough stand at room temperature for 10 minutes. Roll the dough into a 12-inch circle on a lightly floured surface. Transfer the dough to a pie plate and fold any overhanging dough underneath itself so the edge of the dough is flush with the outer edge of the pie plate. Crimp edges as desired. Refrigerate the dough-lined pie plate for 40 minutes, then place in the freezer for 20 minutes. While the crust is in the freezer, adjust the oven racks to the upper-middle and lower-middle positions and preheat the oven to 375 degrees F.
Line the chilled pie plate with two pieces of parchment paper, allowing the parchment edges to hang over the edges of the pie crust. Fill the lined pie crust with pie weights, place on a lined baking sheet and bake on the lower-middle oven rack until lightly golden around the edges, 20 to 25 minutes. Remove the parchment and pie weights, rotate the baking sheet and continue to bake until the crust is golden brown, 5 to 7 more minutes. Brush the surface of the hot crust with the egg white and bake for an additional 1 minute. Make the Pie Filling: While the crust is baking, prepare the pie filling. In a large bowl, whisk together ¾ cup of the sugar, the cornstarch and salt. Add the eggs and egg yolks and whisk to thoroughly combine. Add the buttermilk, heavy cream, melted butter, white vinegar and vanilla extract, and whisk until completely combined. Once the crust is done, reduce the oven temperature to 300 degrees F. If the pie filling has been sitting for a few minutes, give it a short whisk to recombine, then transfer to a 4-cup measuring cup (or other large bowl/cup with a spout). Leaving the pie crust in the oven (just slide the oven rack out a bit), carefully pour the filling into the hot pie shell. Bake for 10 minutes. Again, leaving the pie crust in the oven and just sliding the oven rack out, sprinkle the remaining 2 teaspoons of sugar evenly over the top of the pie. Continue to bake until the center jiggles very slightly when the pie is shaken, 30 to 40 minutes. Remove the pie from the oven and increase the oven temperature to 450 degrees F. Once the oven comes to temperature, place the pie on the upper-middle rack and bake until the top is golden brown, 5 to 7 minutes. Remove from the oven and place the pie plate on a wire rack and allow to cool for 30 minutes. Transfer the pie to the refrigerator and chill for at least 3 hours before serving.